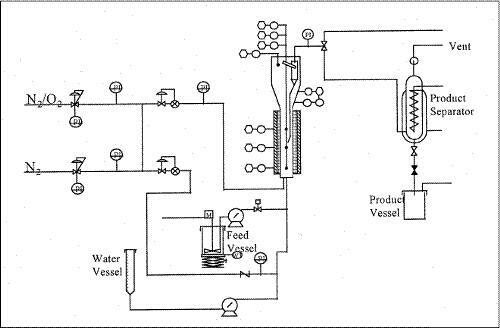 A schematic diagram of the fully automated FCC pilot plant is shown in figure 1. Preheated gas oil feed flows in the bottom of a riser, where it is mixed with hot regenerated catalyst. In the riser the reactions take place and at the riser exit, the mixture flows into the stripper vessel where the separation of gases from the solid catalysts occurs. The solids flow through the spent catalyst lift line and they return to the reactor bottom following regeneration. 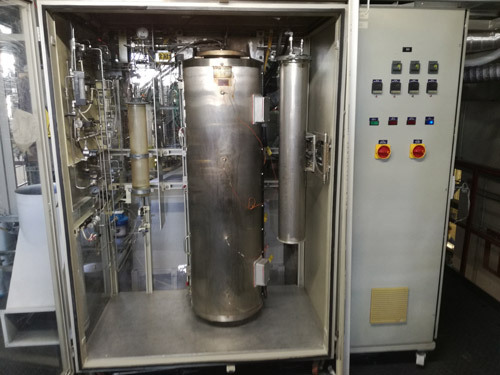 The reaction products, from the stripper exit, flow through a heat exchanger and then after their temperature is reduced to 20°C in order to condense the heavier products. Then the mixture is led to a stabilizer column for better separation of liquid and gaseous products. The specifications of CPERI pilot plant are shown in table 1. Two steamers unit are available in LEFH for fresh FCC catalyst deactivation. 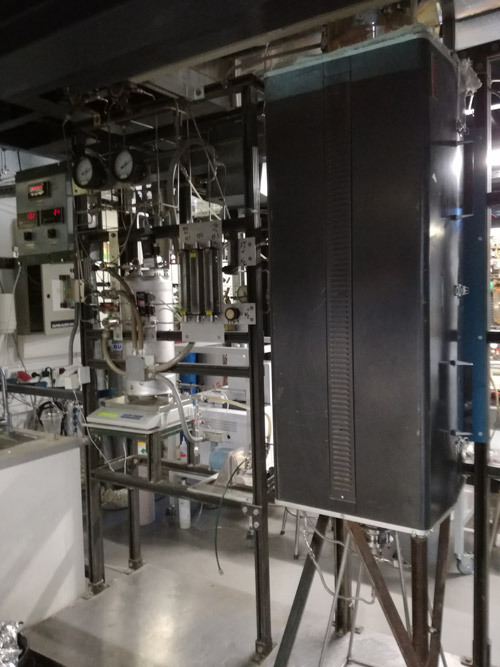 Except for steaming the units can be used and as calcination units for the evaluation of equilibrium FCC catalysts. 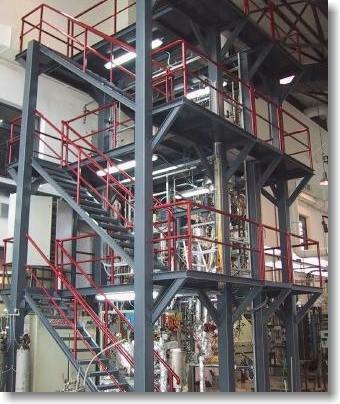 Each unit consists of a quartz fluid bed reactor heated by a 3-zone furnace. Temperature control is achieved with measurements from thermocouple in the catalyst bed. The dimensions of the one steamer are 75cm height and 6cm diameter and accepts 150g of fresh catalyst. The second steamer accepts 3-5 Kg of catalyst. The usage of each unit depends on the forthcoming step for catalyst evaluation (MAT or FCC pilot plant respectively). The fluidization stream is steam and the temperature 1450oF, when the unit is used as a steamer. During the calcination procedure the fluidization stream is air and the temperature applied in the unit is 1005oF. 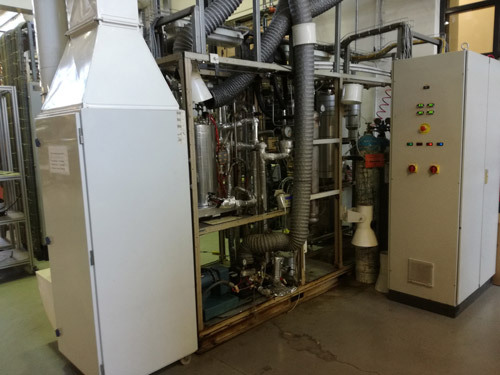 The units are fully automated and steaming or calcination can be terminated after a desired period of time. 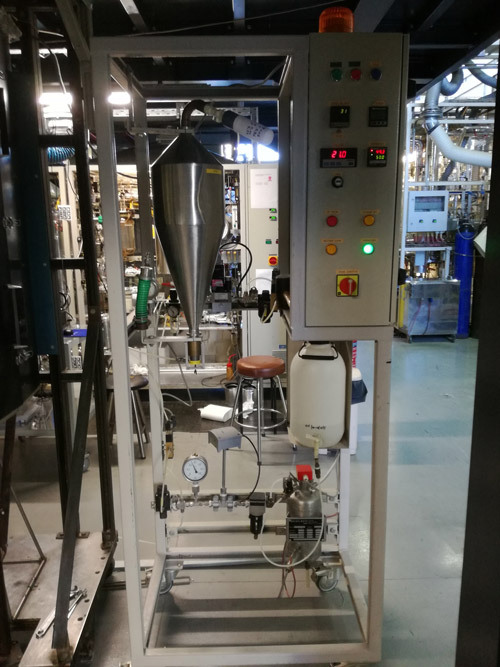 The reaction unit consists of the feed gas system, a fixed- and a fluidized-bed reactor, two three-zone furnaces controlled by PID controllers, one for each type of reactor and the gas analysis system. The fixed- and fluidized-bed reactors are connected in series and can be bypassed by the feed. 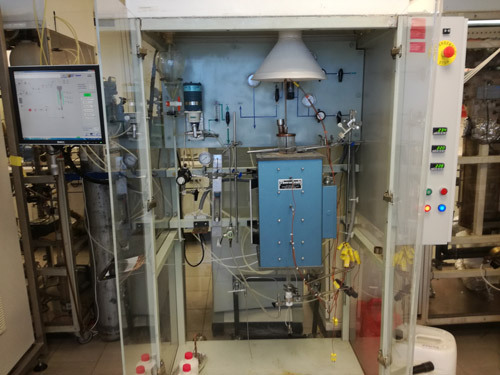 In the fixed-bed experiments the flow rate of the inlet gas was 500 ml/min and the reactor loading was 2 g. In the fluidized-bed experiments the flow rate of the inlet gas was 1000 ml/min and the reactor loading was 10 g. Samples from the exit gas stream were analyzed to identify the gas products during regeneration using series of gas analyzers. 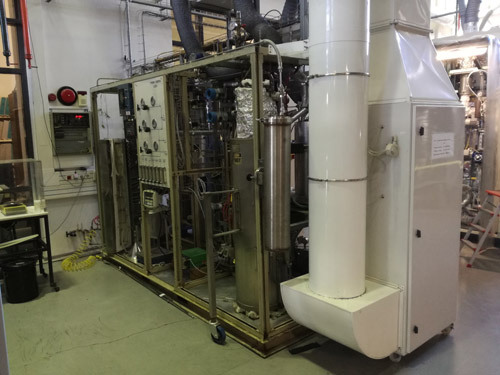 The CPERI cyclic deactivation unit (CDU), designed by Xytel, is fully computerized and simulates satisfactory the E-cats by depositing metals on FCC catalysts. 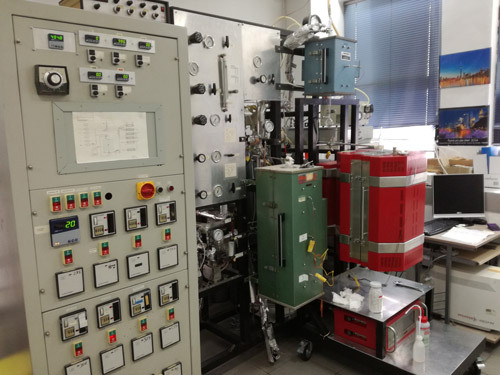 This laboratory method is considered to be the most widely acceptable for FCC catalyst aging. The CDU mimics the FCC catalyst deactivation the catalyst in repeat cycles: cracking, stripping and regeneration. 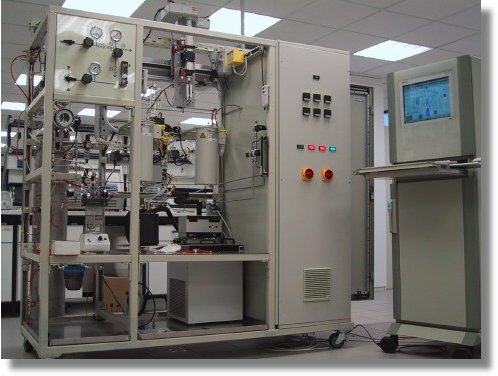 LEFH follows a specific protocol where the complete CDU run consists of 54 cycle, of which each cycle follows a cracking, a stripping and a regeneration step. Each cycle holds for about 60 min. The cracking step is taken place at 500°C for 50s. The stripping is carried out with nitrogen for about 180 sec at 500 °C. The regeneration holds for 2580 sec at 788 °C. The regeneration is achieved by a mixture of O2 and N2. Reactor module: The unit includes of two reactors operating in series. Both reactors are provided with a radiation split-type furnace. For each reactor the catalyst volume (meddle part reactor) can be widely varied by adding more or less inerts. Both reactors can be used in series for up and down flow. An extra "swing pipe" can be installed to by-pass the second reactor. Gas delivery modules: This part of the system contains three (3) independent gas feed modules with all necessary equipment. For this system hydrogen, nitrogen, of a mix of hydrogen/H2S can be used as feed gas. Liquid delivery module: Oil is contained in a nitrogen-blanketed vessel, which is situated on a weigh scale. This feed vessel is provided with electrical heating that is under automatic temperature control by the computer. The pre-sulfhiding liquid is contained in a nitrogen-blanketed vessel. Sampling module: A sample of the product at the separator outlet can be taken via a pneumatic actuated three-way valve. Gas outlet module: Initial part of this module is the pressure control section, which maintains the required reactor pressure. A by-pass is installed for atmospheric operation of the installation. In this case the outlet lines, incl. Pressure control section, are heat traced and insulated. The outlet vent is connected to a wet test meter to measure the outlet flow of the system. Separation and liquid outlet module: A pipe in pipe cooler cools the reactor outlet product. The separator has a narrow electrically heated liquid-part and wide water cooled gas-part. Product is collected in a heated vessel, which is located on a weigh scale. Normally the vessel is vented to the gas module. 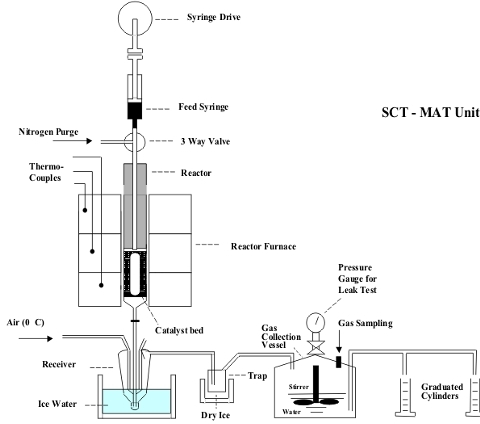 The SCT-MAT reactor is made by Pyrex glass and it is heated by a three-zone furnace. Preheated feed (60°C) is injected into the reactor through an oil capillary heated only by the oven. For this injection a special motor pump is used. The reactor consists of an annular bed where the catalyst is diluted with inert glass beads. The vapor products of the cracking are cooled to 0 °C at the reactor exit where part of them are condensed and collected in a specially designed high volume liquid receiver. The remaining not condensed gaseous products are led to gas collection system (cylinders) and are collected by water displacement. Following the oil injection, N2 flows into the reactor in order to drive the products along the reactor. The gaseous products are analyzed at a specially designed GC called Refinery Gas Analyzer (HP-5890). 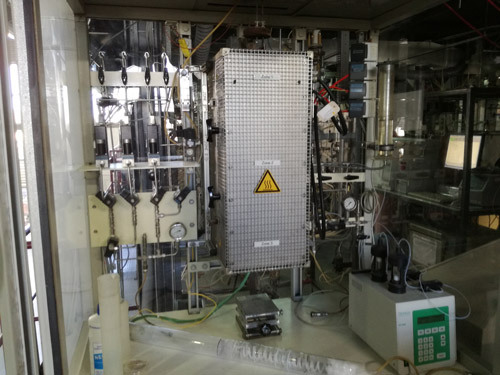 The gasoline produced is analyzed by Capillary Gas Chromatography (HP 5880 A). The weight of coke, deposited on the catalyst, is measured by an Elemental Analyzer (Leco CHN-800 model). One of the most important parameters which determine the yield, the quality of FCC products and in general the competitiveness of FCC unit is the catalyst type. It is, therefore, important to be able to predict the effectiveness of FCC catalyst with reliable laboratory tests. With these test the refineries can choose the most satisfactory catalyst. 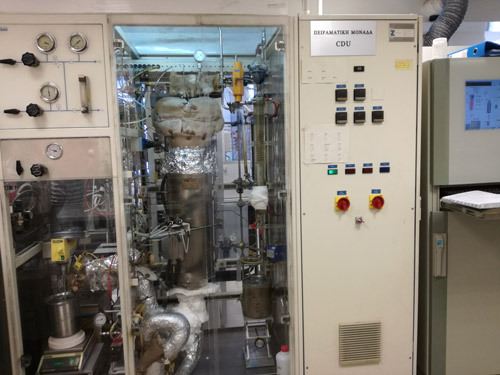 A large Cyclic Propylene Steaming (CPS) deactivation unit is available in LEFH for FCC catalyst deactivation. 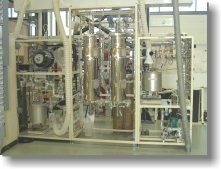 The unit is fully automated and consists of a metal fluid bed reactor heated by a 3-zone furnace. Temperature control is achieved with measurements from thermocouple in the catalyst bed. The CPS unit accepts about 5 Kg of FCC catalyst. Metals are deposited on the catalysts following a standard wet impregnation method. Then the catalyst is loaded in the CPS unit for the deactivation. A special protocol is applied in the unit using alternate oxidation-reduction cycles. The oxidation takes place with a mixture of air while the reduction with a mixture of propylene. Steam is always added in the unit for all cycles. CPERI's analytical services have been certified and approved by Lloyd's Register Quality Assurance to conform to the BC EN ISO 9001 quality management system standard and ISO 17025 quality policy, with respect to the provision of laboratory inspection services related to fuel content and solid characterization.